A year ago at this time I had the idea for a different type of learning experience after listening to Seth Godin talk about his AltMBA program. Seth said that people spend hundreds of thousands of dollars and years of their life at graduate school receiving an MBA. Then they get into the world and realize they need to continually be learning, and need a network that supports and shares both the best (and the next) practices in their field. I had a conversation with my colleagues in my district and around the country about a new way to do professional learning for teachers, instructional coaches, and leaders. One that would take way less time (only 6 months), cost way less money, and provide ongoing support and guidance for a much longer time. These conversations led to creating the Innovative Teaching Academy and bring on our first cohort of 612 teachers, coaches, and leaders last March. You see, I struggled for years to start a blog. I would have a new idea, start posting blog posts, and never get anywhere, before giving up. Then I found a community of bloggers that held each other accountable, and things dramatically changed. I spent so much time looking for strategies and projects that would engage and empower my students. Until I found research backed practices that made innovation a reality in my classroom. I made so mistakes as a leader (and still do) but have been supported by other experts in different areas who spend the time I don’t have to show us what works (and what doesn’t) in schools…instead of talking in theory. This is why I felt so strongly about creating the Innovative Teaching Academy. I’ve learned first hand that you need specific resources, people, systems, and community to make spark innovation in any classroom or school. 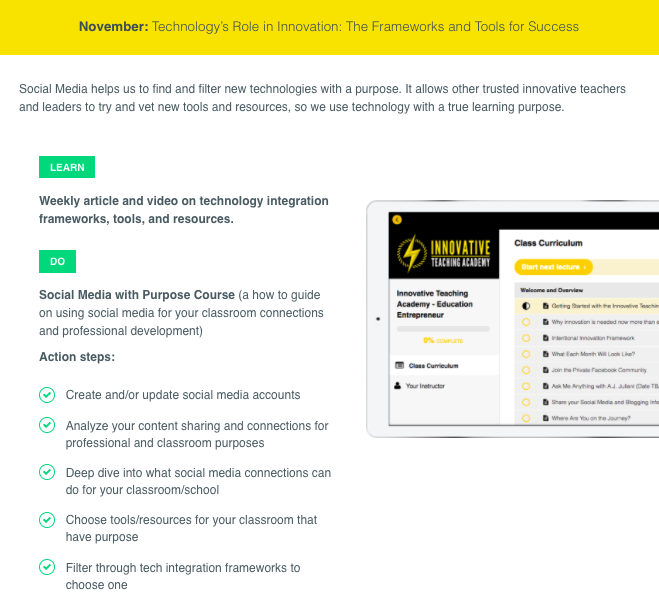 The Innovative Teaching Academy is a six-month online learning experience that gives you the tools, resources, and community needed to break the mold of traditional schooling (whether as a teacher, instructional coach, or school leader). The Innovative Teaching Academy isn’t just a course. 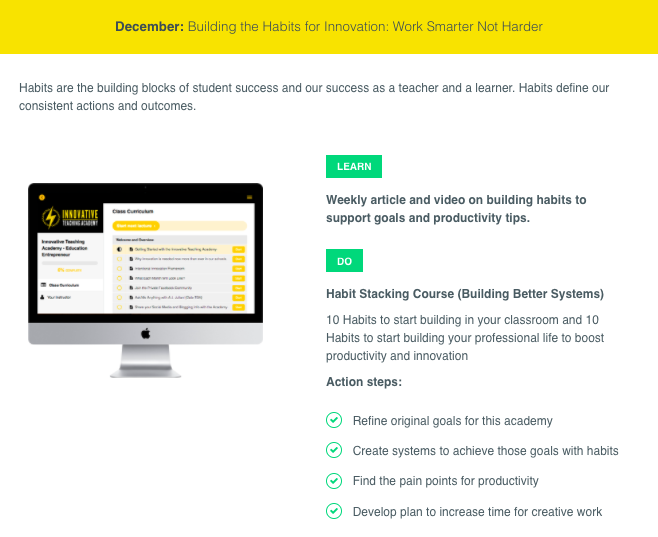 It’s a master class and coaching system designed to take you through step-by-step lessons and teach you the principles and strategies needed to make a greater impact in education and reach more people. And to provide the accountability and support system we all need to thrive. The academy is grounded in proven principles and strategies that work. 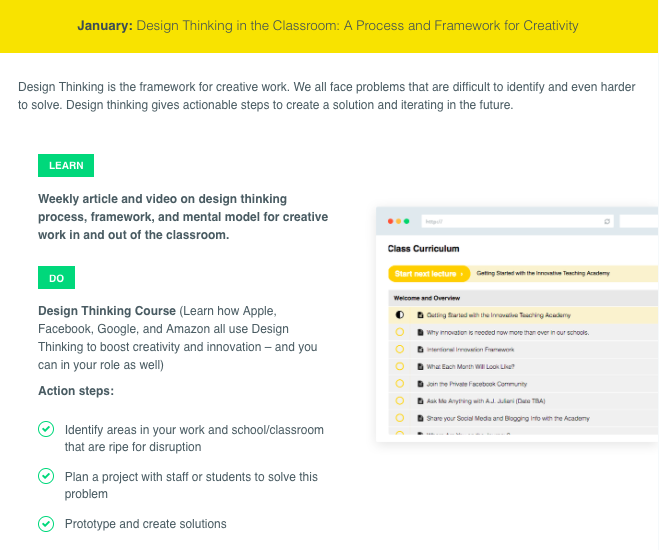 It’s broken down into simple, step-by-step lessons that allow you to walk through each of the six phases of innovative teaching and learning. 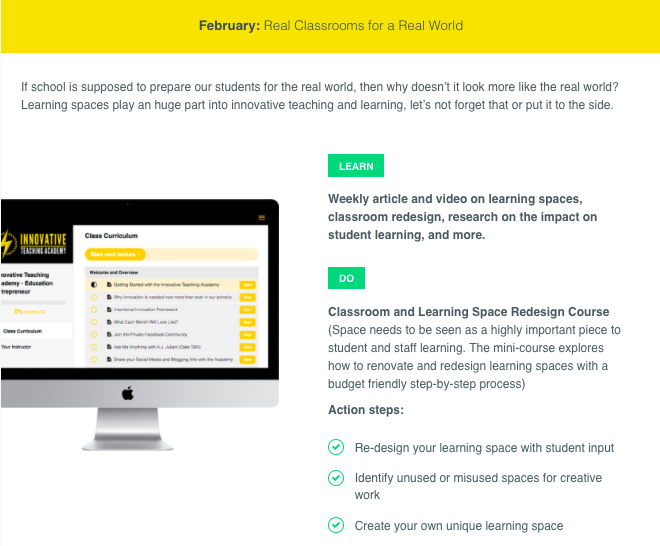 What is inside the Innovative Teaching Academy? Each Month of the Academy has a different focus. 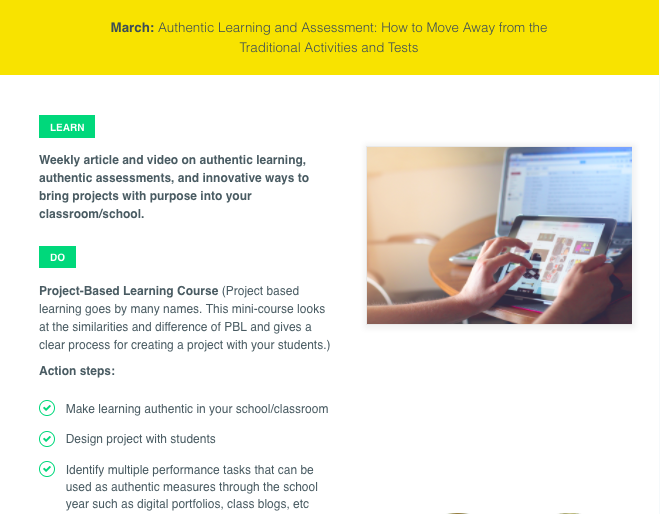 At the beginning of the month you’ll receive a full course on topics such as Building a Better Blog, Social Media with Purpose, Design Thinking, Learning Space Design, Project-Based Learning, and Authentic Work. 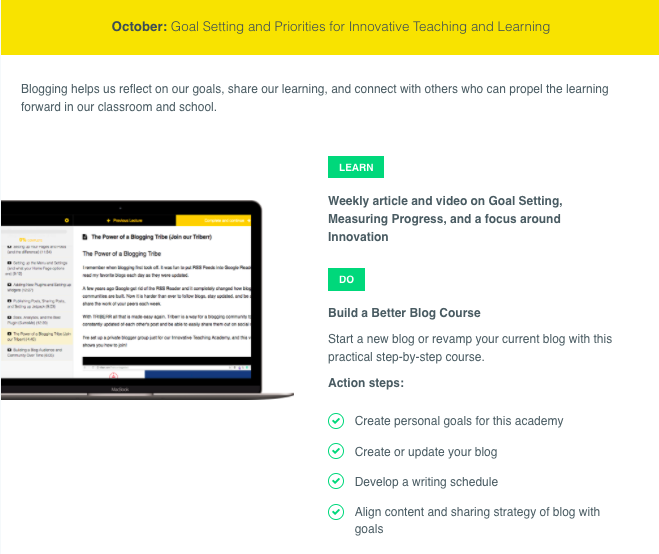 Each week you’ll also receive a new article, video, and resource to prompt discussion in our private group and also help you complete the action items for the month. You’ll also get access to live interviews with experts and leaders in each field, being able to ask them your questions and dive deep into each area with their guidance. During all of this, you’ll have access to our Private Facebook Community and online coaching for support, guidance, and the community we all need to thrive! Do not join the academy if you are looking for a quick-fix to innovation and creativity in the classroom. If you’re just hunting around for another blog post or podcast episode where you can pick up a random strategy to “try out,” you will HATE this experience. But if you’re sick and tired of not being able to turn your ideas into real innovative change, and you’re ready to follow a proven system to fix that, you’ll love it. If you’ve always wanted time-tested courses, an accountability system, a coach and a supportive community to walk with you as you grow, you’ll love the Innovative Teaching Academy. It is exactly what I wish I had much earlier in my education career. That’s why we built this academy and are excited to share it with you! The Academy is open for enrollment from September 28-October 8th only. Let’s do this together! I am an instructional specialist and saw the opportunity to participate in the Innovative Teaching Academy. I brought the idea to the curriculum and instruction director and she was interested as well. We just got our PO approved for joining the ITA, but want to be sure it is still ok to enroll at this point.